We specialize in tribal government with a focus on Economic Development, Communications & Grant Funding & Engineering. Communications for Indian Country has always been the tap-root of our culture. Today, tribes are facing a dire need to diversify both their business and government means of enhancing the economic health of their communities. EnerTribe has a highly effective permitting team. EnerTribe has a highly successful grants department and has helped fund well over $250,000,000.00 in projects. In this day and age, having a website is just not enough anymore. Dv’laa Haa~ (Welcome), EnerTribe is a native & woman owned consulting firm. We specialize in tribal government with a focus on Economic Development, Communications, Grant Funding, and Engineering. Current EnerTribe contracts include: tribal governments, tribal enterprise, government agencies, for-profit companies, municipalities, non-profits and other various organizations. EnerTribe was built by Indian Country for Indian Country. EnerTribe NEWS: EnerTribe CEO will be attending TribalNet this year. Did you know that the EnerTribe team authors a quarterly article on critical topics for Indian Country? 2017 – EnerTribe negotiates partnership between Union Wireless and two tribes to help build Broadband infrastructure on the Wind River Reservation. Mauris efficitur lorem laoreet mattis blandit. 2014 – EnerTribe wins EDA grant for the Hoopa tribe in California. Do you need funding to complete a CEDS or other economic development efforts or planning? Ask us how. Union Wireless funds two Fiber Optic builds for Indian Country! 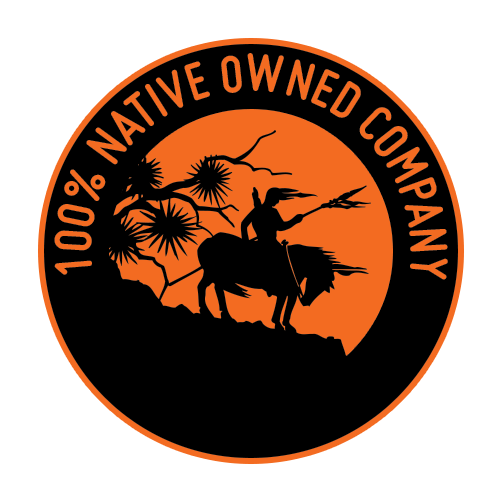 EnerTribe partners with another Native owned company to help serve Indian Country. Trinity Valley Consulting Engineers is a company based in Willow Creek California. EnerTribe helps TVCE with their Branding and website build.